A long long time ago, around the 5th century BC in Ancient Greece, there were a bunch of hip kids called the Sophists who loved to talk. Actually, not just talk. They loved teaching people how to debate and come up with persuasive arguments to influence the opinions and beliefs of others through the use of rhetoric. Rhetoric is the art of using language for persuasive ends. Not unlike copywriting. So, the Sophists would travel around from town to town, staying in the finest 4-star mud-brick homes, eating the best roast boar sandwiches, and wearing the hottest tunics and sandals around. They were very popular, well-paid professionals who knew how to impress and persuade an audience. Despite their popularity, one guy was concerned that their methods of persuasion were a little too emotional, a little too flowery, a little too lacking in, well … proof. Aristotle was also well-versed in rhetoric and persuasion, and he thought some of the Sophists might be using rhetoric to manipulate by focusing too much on emotion, and rather handily washing over “fact” with large brush strokes. It’s not that he was against persuasion. When you’ve got an important message that can inspire, educate or help people, you need to be able to communicate that. He believed there was a better way of persuading people without using bloated testimonials, yellow highlighter, false scarcity, too much poetry and fanciful language. So Aristotle came up with his own rules of persuasion. And despite these rules being more than 2300 years old, when you apply them to your copywriting, you’ve got something that persuades as well as being authentic and having integrity. Aristotle pretty much said that having good morals and an above-board character wasn’t enough; you had to establish this to your audience. In other words, it doesn’t matter how wonderful and ethical a person you are if you don’t communicate that. Ethos is a powerful persuasive force — don’t ignore it. To put it simply, logos means if you want to make a point, you’d better back it up with proof. You can’t just go out there making pie-in-the sky promises. Pathos is the part the Sophists were very good at because it means whipping up emotions. Aristotle was all for moving people emotionally to aid persuasion, as long as it was based on sound Ethos, and backed up by staunch Logos. I’m betting Aristotle would have been a persuasive force to be reckoned with were he a copywriter today. I’m also pretty confident that he would use his persuasion with integrity — to reveal value to those who needed to know it — and not to manipulate in order to make a sale. So if you fancy following in Aristotle’s footsteps (beard and tunic optional) double-check your copy to make sure it displays your robust character, is backed up with plenty of proof, and stirs your audience’s emotions enough to take action. Previous article: How Can The King’s Speech Help You Build an Extraordinary Online Business? Next article: Did Social Media Kill the Marketing Star? It’s interesting that you like Aristotle. One philosophy professor mentioned that all philosophy is a series of footnotes to Plato and Aristotle. I think Socrates would be a better model. In fact, if you Google “Socrates Copywriting”, you will notice an interesting article combining these two subjects. But seriously! I don’t want to do Aristotle a disservice. You have done a great job combining his ideas with copywriting. I just think that Socrates, by a series of penetrating questions, gets his listeners to agree with his ideas – all on their own volition. Hi Randy, great point, I just spent 30 minutes of my attention re-reading about Socrates and his methods 🙂 it’s great stuff. For this article, I liked being able to bring it back to the elements of Pathos, Logos and Ethos and comparing Aristotle’s method to the Sophists (as i think a lot of people can relate and are tired of the Sophist-esque method). But you’re absolutely right, Socrates was a very clever guy in being able to inch closer and closer to agreement with subtle questioning. And the more you can get your audience to articulate the points themselves, the more persuasive you will be. Great points. I always had trouble understanding some of the masters. It is interesting to note that asking questions is a great way to learn. Really enjoyed reading this Amy. I’ve been thinking about this a lot recently (integrity marketing, not Aristotle!). It’s taken me a really long time to conclude that marketing with complete integrity is the only way to go. I’d been persuaded by very adept marketers that you ‘have’ to push people or they won’t take action and it’s for their own good. There is some truth in that but it’s how you push that is so critical. I’ve spent time and money learning ways I just don’t like! It feels really good to do a new sales video and not put in any crappy pressure but just tell the complete truth. I loved telling people that just buying the product won’t give them a great looking garden, they need to do the course & if they are not someone that does courses, don’t buy! My lesson has been assuming that more successful people’s judgement are better than my own isn’t always the case. Learning to trust my judgement / integrity & it feels good! Hey Rachel, I’ve seen similar “push” methods, and if ti’s about revealing value so that a customer realises how important your offer is to them then it’s a critical skill. But if it’s about making them feel guilty, uncomfortable, or manipulating the emotions for hte sake of it, I couldn’t get on board. Amy, this is a fantastic post! You’ve brought history alive and presented it in a way we can apply to our own writing. I’d also like to endorse your “How to Get Your Sales Page DONE!” e-book. I’ve read it and used it, and can vouch for its effectiveness. You’ve created a process that explains every step clearly and makes writing a sales letter less daunting. I highly recommend it! Thanks Pamela! That’s lovely. Geekily, I do think it would have been a really exciting time to be in, I would love to have heard them debate and persuade (though not sure how far my knowledge of ancient Greek would get me). It was fun to write. This is outstanding, Amy! And I rarely use that word. But I did notice things alway do come back to emotions. I was in Outside and Inside Sales for years, and it was always about hitting the Emotions and then backing it up with Logic. Make them want it, then give them rational justification. Right Brain / Left Brain, if you will. And it makes sense that the sales pattern follows our own personal buying pattern of emotional buying justified by logic. Like when I get freakishly excited about buying notebooks and pens, and then tell myself how I really need all of them for all the different “business ideas” or “content ideas” I’m going to have…. and then always carry the same notebook and same pen. Going out on a limb here, but guessing you have a “favourite” pen. But i am pretty sure that’s Plato on the pic. Nope. That’s Aristotle in the photo. The statue is in Stageira (Greece). Great post. Thanks again Copyblogger. Fantastic post. I really enjoyed this and it is probably one of the best reads on copywriting and persuasion that I’ve read in a long, long time. Thanks!!! Excellent post, Amy. It certainly proves that great advice is timeless. As a final touch, I’d probably add one more thing to the list — gyros — because it’s never good to write on an empty stomach. Thanks Amy for the great post – I really enjoyed it! I think it’s something that a lot of people do relate to. They want to find a balance of persuasion because they’re passionate about what they do, but don’t want to cross over into the relams of greed and selling to anyone just because they “might” buy. That was fun Amy – thanks for sharing. Ethos, Logos & Pathos. Sounds like a Greek legal firm to me. I really wanted to squeeze Lego in there as well but just couldn’t manage it…. What a great article! I really enjoyed how you took an analogy and carried it out the way that you did. Too often, titles and opening paragraphs of how-to articles start with a terrific analogy, but then all falls apart. Didn’t happen with you! Cracking stuff Amy – a blog I read (Art of Manliness) has done a series on classical rhetoric, and I’ve been pondering on how to incorporate it into my writing. Looks like you’re a step ahead of the pondering stage! I really enjoyed reading that! What a pleasant and well-organized little lesson. Great article. I especially liked the advice to back up what you say and make what you write personal. Thanks for writing such a riveting article. I think I may go read some philosophy now. Your personal story- good and bad will stand above any other marketing tactic. Be humble, admit your mistakes and tell people how they can learn from your mistakes….that you can save them the “pain” of making the same mistake. I also believe in writing and speaking in layman’s terms…just because I may be further ahead of someone on this journey of blogging/making money….I don’t feel I need to use fancy language that will just confuse them. Hey Carolee! Thank you for your comment. This is good, I like the way you mix the old and new to show what works. It’s so true that you can have morals but if you don’t share your morals and values in your everyday life. Thank you for taking me back to 5th century BC in Ancient Greece. It was a nice visit. Highlighted texts and tacky site designs just came to me. Idk why. Love learning history and the masters. Thanks for this post, Amy, great back up. I really enjoyed this post– fun and informative. As a copywriter with a background in philosophy, I have always looked toward the ancient masters for tips. It is worth noting, of course, that these were invented in a time of largely unwritten speech (these great thinkers were literate, but the world was based on a tradition of making your points through public speech)– and that being “non-poetic” did not mean that your orating lacked a theatrical quality. When it comes to making GOOD content, I always keep the classic list of logical fallacies (http://www.nizkor.org/features/fallacies/) in mind. That was terrific. You made history interesting for me, with your fine copywriting skills. Your story telling style is beautiful. You taught me two lessons. Ancient history (again) which I never cared for partly because my eight grade instructor was a complete bore. And I was too busy entertaining two of the cutes girls in the class. The other lesson is some very valuable copywriting tips. One other “thing” I am not going to pass this information on to my clients. They might fire me and hire you. Now that would be a hard lesson. Thanks for the education. You definitely get an A for subject matter knowledge. I like your post and so does everyone that came before me so ‘well done!’ It has upset me a little bit though. I studied Philosophy for two whole years and all the Greek crowd were paraded around for my education very early in the morning on a Monday and a Tuesday. I never regretted sleeping through those classes; I thought that arguments and togas were a bad idea before breakfast. I couldn’t see the point. Now though, I feel like an idiot 🙁 all that wisdom and I can’t remember any of it. If I’d only had a regular coffee in the morning then I’d be a better copywriter now. What a miserable thought. What an opportunity missed. Oh well, I’m not completely inconsolable, at least you’re giving me the highlights. I second that. Anyone who prefers good old Socrates, God bless him, to Aristotle hasn’t read enough A. All study begins with Aristotle. ‘Tis a shame that all we have of him is basically notes that he would expand on as he walked. Like everyone else, I really enjoyed your article. All the lazy copywriters out there should be forced to read it and copy it out at least 10 times until they get the picture. In in this brief, 911-word article, you’ve managed to outline three major secrets to writing successful sales letters. Secrets that other copywriters charge between $497 and $5000 to reveal. But don’t give away the farm. I found this to be a great piece. Though training people in television journalism is my background, I am finding some of the posts in copyblogger.com fascinating and useful. While teaching television journalism I have been following some of Aristotle’s ideas unknowingly. Telling students about my practical experience as TV Journalist. Thanks for the piece Amy. Amy you really blew our minds! One of the best posts I ‘ve ever read. Surprised that you talked about “pathos” “logos” , “ethos” of Aristotle. (Also “hyperbole” is a greek work which is still use today, too). Even more surprised that you brought Aristotles methods into blogging. Well done. Now about Socrates. As we know, what Socrates did was posing special questions that would make you reveal the truth you had inside you but you were not aware of. So in the end you were able to answer your own questions through his guidance. The word we use for the Socratic method means “deliver a woman”. Just as the doctor helps the pregnant woman to deliver, that ‘s how Socrates helped people to express and convey what they already had inside them. 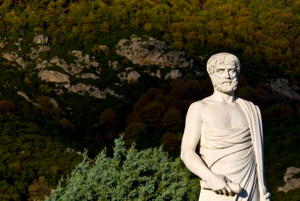 I think Aristotle’s doctrine applies better in marketing and blogging than Socrates does. Wow Steven, thanks for the Socrates showdown! That’s fascinating and I agree, for me, Aristotle’s methods worked really well for copywriting, whereas Socrates would have been a killer in-person salesman for sure. I can imagine him posing questions on my doorstep and buying every single domestic cleaning product he had. I joke, but I find these methods genuinely fascinating, especially how they are still so relevant today. Shows you how some things in human nature just never change. This has been one of my favorite posts to Copyblogger because I feel it encompasses the key points of many of the other posts. Great job, Amy. Ethos Pathos and Logos of Copywriting. Awesome. Definitely one of my favorite articles of the week Amy! Anyway, I am glad that, no matter how ancient, true wisdom from a great philosopher can really withstand the test of time and still find value in the modern world. Ethos, logos, pathos are great things to consider in writing effective content, indeed. I really enjoyed your copy. You have a great website. Thanks for the post. It was a good read. Great article – way to break it down and relate it to the classics. It’s kind of about getting back to basics and remembering what’s really important. These values have stuck around all this time for a reason, right? Not bad at all — and that’s from an Aristotle scholar who works on the interconnections between his Rhetoric, the two Ethics and the Politics. Good, thoughtful adaptation of Aristotle’s thought here.